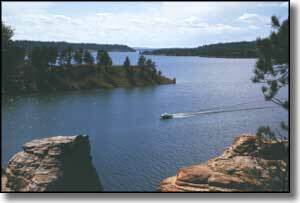 Keyhole State Park is situated on the southeast shore of Keyhole Reservoir, a beautiful man-made lake within sight of the famous Devils Tower National Monument (remember this from the 1977 movie Close Encounters of the Third Kind?). A private concessionaire operates a marina and motel on the headquarters side of the lake. He offers gas, propane, fishing supplies, groceries, soda, and 10 campsites with electric hookups. The boat ramp at the marina is public. The area is full of wild turkey, pronghorns and mule and white-tailed deer, the fishing (channel catfish, walleye, northern pike, and smallmouth bass) is excellent and the lake is a mecca for bird watchers with many resident and migrating species represented. Keyhole State Park features ten campgrounds, all overlooking the lake. Most campgrounds have overflow parking areas for extra vehicles, too. Most sites will handle trailers and large RV's. While the State Park is open year-round, most services are discontinued on September 30. Arch Rock: 13 campsites with gravel pads and one universally accessible site with a concrete pad. Each site has a fire ring and picnic table. Rest rooms and water hydrants are spaced through the area. 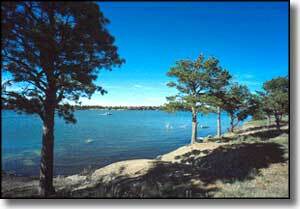 Most campsites are in the pines and when the lake is full, there is easy access to the water. Tatanka: 33 campsites with gravel pads, two universally accessible sites with concrete pads. There are also 5 tent sites, one of which is universally accessible. Each campsite has a picnic table and fire ring with rest rooms and water hydrants spaced through the area. Most campsites are in the pines but a few aren't, and are somewhat "shade-challenged." There is also a universally accessible, reservable day use shelter available. When the lake is full, the water is easy to get to. Pronghorn: 33 campsites with gravel pads and 2 universally accessible sites with concrete pads. Each site has its own fire ring and picnic table with rest rooms and water hydrants spaced through the area. There are a few pull-through sites but most are back-in. All campsites are in the pines but because of the terrain, access to the lake by foot is difficult. This campground also has universally accessible playground equipment. Pat's Point: 45 campsites, some developed, some on the grass. All sites have picnic tables and fire rings with rest rooms and water hydrants spread through the area. Some sites are in the pines but most are "shade-challenged." When the reservoir is full, the water access is easy and the boat ramp is functional. There is a large, reservable group shelter in this area, too. Homestead: These 40 campsites with gravel pads and three universally accessible sites with concrete pads are built away from the reservoir along the pines. All sites have picnic tables and fire rings with rest rooms and water hydrants spaced through the area. Some sites are pull-through but most are back-in. Cottonwood: These 35 undeveloped campsites are in among the pines. Each site has a fire ring and picnic table, with water hydrants and rest rooms spaced through the area. In the middle of the campgrounds is a good collection of universally accessible playground equipment. There is also a reservable shelter but access to the lake is not easy. Rocky Point: These 22 undeveloped campsites with fire rings and picnic tables are out in the open with easy access to the lake. Rest rooms and water hydrants are spaced through the area. Wind Creek: 16 undeveloped campsites with fire rings, picnic tables and nearby rest rooms but no running water in the area. Most sites are in or near the pines and the boat ramp is functional when the reservoir is full. Coulter Bay: 16 sites, each with a fire ring and picnic table, with rest rooms and water hydrants nearby. Half these sites are walk-in tent sites along the rock cliffs. This whole campground can be reserved and is often used as a major boat launching area. 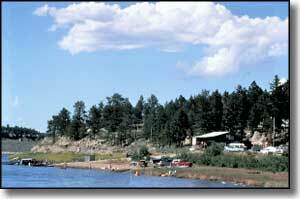 Keyhole State Park is located between Moorcroft and Sundance, Wyoming, on the western edge of the Black Hills. Access is easiest from Moorcroft via US 14 for 6 miles north to State Road 113. Photos courtesy of Wyoming State Parks. Map courtesy of National Geographic Topo!